Barcelona is a city known for its fantastic seafood, mind-boggling architecture, world-class soccer, lively parties, and fabulous weather. But in recent years the Mediterranean city has developed a major problem it’s now struggling to correct: alarming levels of air pollution. 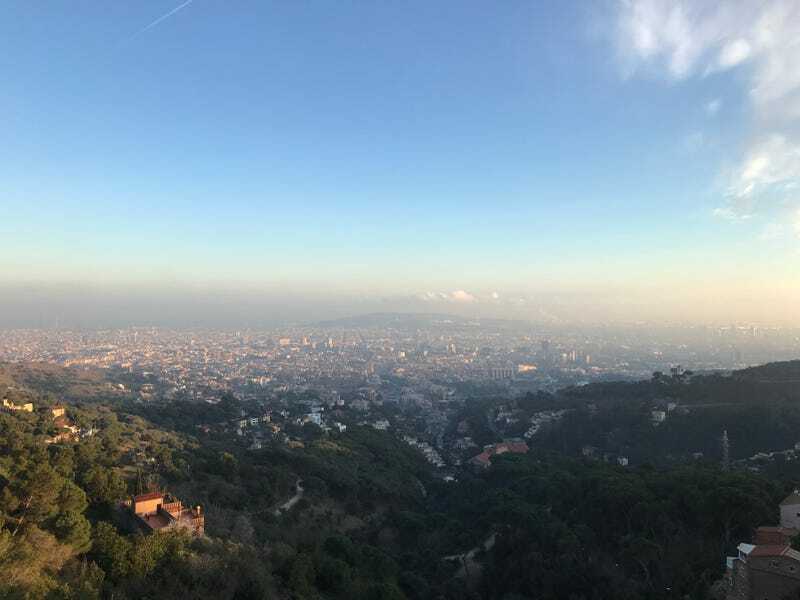 Barcelona’s poor air quality, which is a product of its density (the third highest of any European city) and its geographic location (hemmed in between the sea and the mountains) is thought to cause about 3,500 premature deaths a year. But the city has a plan to tackle its air pollution problem: prohibit old, polluting vehicles from entering the city, which is anticipated to reduce traffic related emissions by 30% over the next 15 years. Beginning in 2020, cars and motorcycles built before 2000 (or diesel cars manufactured before 2006) will be banned from city roads during weekdays (from 7 am to 8 pm). And as of December, 2017, older cars have already been prohibited from driving in the city during periods of high pollution. This isn’t the first law of its kind; the EU has set standards for air quality that member states are obligated to meet, and cities like Paris, Oslo,and Oxford have vehicle bans and restrictions in attempts to get their air up to snuff. But Barcelona’s new plan is unique in its sweep; the law establishes a “low-emissions zone” that encompasses not only the entire city but also the surrounding municipalities. In all, it’s meant to create 95 square kilometers of freshly-squeezed-oxygen, so good you can taste it. “Here in Barcelona, we’ve decided to protect the entire population,” explained Maíta Fernandez-Armesto Sánchez, project coordinator for the city’s Office of Mobility and Infrastructure. “This is about improving the health of everyone in the city, and if the price is that some people must walk or take the bus, then it’s worth it.” Fernandez-Armesto pointed to statistics that show that in Barcelona, the number of fatalities attributed to pollution is much higher than those attributed to car accidents. “This isn’t a law meant to punish people that have older cars…it’s meant to keep Barcelona healthy,” she said. The law aims to curb nitrogen dioxide (NO2) emissions, which can lead to things like acid rain and higher rates of respiratory issues including asthma. And older cars are largely to blame: according to statistics from Barcelona’s Department of Air Quality Planning, cars produced before 1997 emit 11.6 times more nitrogen oxide than vehicles built to current standards. In theory, Barcelona’s law is already in effect; older cars are prohibited from circulating in the city on days when the atmospheric pollution levels rise above maximum established limits, and when the forecasts don’t indicate weather that will make the NO2 disperse. However, since December there haven’t been any high contamination episodes. Fernandez-Armesto explained that this is likely do to a combination of wind and rain that has pulled the pollution from the city. “However, what we’re really concerned with is the permanent exposure to contamination, not just specific episodes, and that’s why the regulations will become permanent in 2020,” she said. Fernandez-Armesto explained that on days when the restrictions will be enforced, the public will be notified in advance via all conceivable communication channels, including newspapers, radio, TV, road signage, and social media. But if someone still decides to take their old whip out for a spin, they’ll be hit with a hundred euro fine. The ban is anticipated to impact almost 130,000 drivers, removing about 16% of all the cars roaming around Barcelona. And some believe the burden of the law will fall unfairly on lower-income residents, as they’re more likely to own older vehicles. The city has offered three-year public transportation passes to citizens that give up their old cars, but some residents have still voiced their annoyance with the new law. Fernandez-Armesto went on the emphasize that this program is part of a larger effort by the city to change the way its citizens move through the urban space. “We’re trying to get the average citizen to not take his private car when it isn’t necessary, when he has alternatives,” she explained. “We want to encourage the public to use more sustainable methods of transportation.” And the city isn’t just all talk: in the past few years, Barcelona has dramatically increased its bike-path network, grown its bike-sharing infrastructure, increasing its public transportation reach, and worked to reduce the flow of traffic (by 20%!) and gave more room for pedestrians by creating urban spaces called Superblocks.